New details are out this morning about the specific issues that suburban police chiefs are going to raise today as they express “no confidence” in the performance of Kim Foxx as Cook County State’s Attorney. 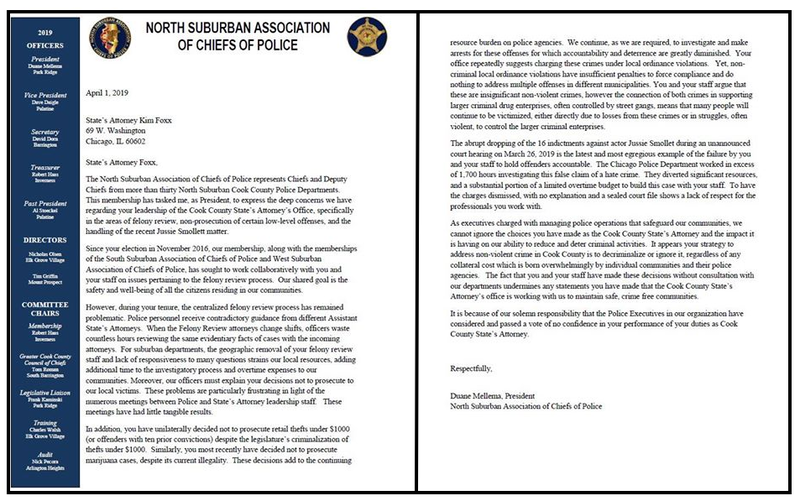 CWBChicago reported last night that the North Suburban Association of Chiefs of Police had sent Foxx a “no-confidence” letter and the group would be participating in a press conference with the Chicago Fraternal Order of Police to announce their concerns this afternoon. Groups representing the south and west suburban police chiefs have also drawn up similar letters and will attend the press conference, according to reports. A Chicago FOP spokesperson Wednesday denied that a “no confidence” posture would be the topic of this afternoon’s press event. 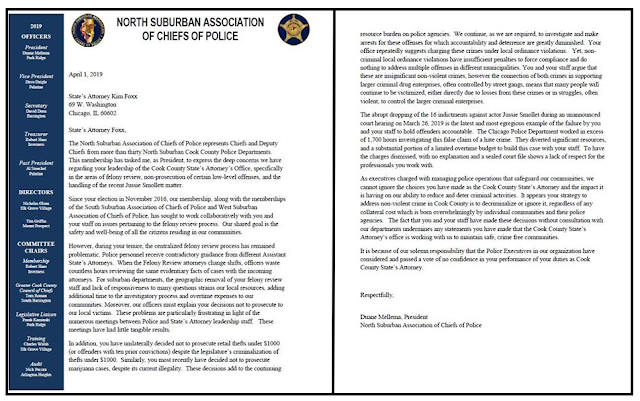 This morning, CWBChicago has secured a full copy of the letter sent to Foxx by North Suburban Association of Chiefs of Police President Duane Mellema, who serves as Deputy Police Chief in Park Ridge. The letter also takes issue with hurdles that front line officers must navigate to win approval of felony charges under Foxx as well as Foxx’s refusal to pursue charges in many shoplifting and cannabis cases. The North Suburban Association of Chiefs of Police represents Chiefs and Deputy Chiefs from more than thirty North Suburban Cook County Police Departments. This membership has tasked me, as President, to express the deep concerns we have regarding your leadership of the Cook County State’s Attorney’s Office, specifically in the areas of felony review, non-prosecution of certain low-level offenses, and the handling of the recent Jussie Smollett matter. Since your election in November 2016, our membership, along with the memberships of the South Suburban Association of Chiefs of Police and West Suburban Association of Chiefs of Police, has sought to work collaboratively with you and your staff on issues pertaining to the felony review process. Our shared goal is the safety and well-being of all the citizens residing in our communities. However, during your tenure, the centralized felony review process has remained problematic. Police personnel receive contradictory guidance from different Assistant State’s Attorneys. When the Felony Review attorneys change shifts, officers waste countless hours reviewing the same evidentiary facts of cases with the incoming attorneys. For suburban departments, the geographic removal of your felony review staff and lack of responsiveness to many questions strains our local resources, adding additional time to the investigatory process and overtime expenses to our communities. Moreover, our officers must explain your decisions not to prosecute to our local victims. These problems are particularly frustrating in light of the numerous meetings between Police and State’s Attorney leadership staff. These meetings have had little tangible results. In addition, you have unilaterally decided not to prosecute retail thefts under $1000 (or offenders with ten prior convictions) despite the legislature’s criminalization of thefts under $1000. Similarly, you most recently have decided not to prosecute marijuana cases, despite its current illegality. These decisions add to the continuing resource burden on police agencies. We continue, as we are required, to investigate and make arrests for these offenses for which accountability and deterrence are greatly diminished. Your office repeatedly suggests charging these crimes under local ordinance violations. yet, non-criminal local ordinance violations have insufficient penalties to force compliance and do nothing to address multiple offenses in different municipalities. You and your staff argue that these are insignificant non-violent crimes, however the connection of both crimes in supporting larger criminal drug enterprises, often controlled by street gangs, means that many people will continue to be victimized, either directly due to losses from these crimes or in struggles, often violent, to control the larger criminal enterprises. The abrupt dropping of the 16 indictments against actor Jussie Smollett during an unannounced court hearing on March 26, 2019 is the latest and most egregious example of the failure by you and your staff to hold offenders accountable. The Chicago Police Department worked in excess of 1,700 hours investigating the false claim of a hate crime. They diverted significant resources, and a substantial portion of a limited overtime budget to build this case with your staff. To have the charges dismissed with no explanation and a sealed court file shows a lack of respect for the professionals you work with. As executives charged with managing police operations that safeguard our communities, we cannot ignore the choices you have made as Cook County State’s Attorney and the impact it is having on our ability to reduce and deter criminal activities. It appears your strategy to address non-violent crime in Cook County is to decriminalize or ignore it, regardless of any collateral cost which is born overwhelmingly by individual communities and their police agencies. The fact that you and your staff have made these decisions without consultation with our departments undermines any statements you have made that the Cook County State’s Attorney’s office is working with us to maintain safe, crime free communities. It is because of our solemn responsibility that the Police Executives in our organization have considered and passed a vote of no confidence in your performance of your duties as Cook County State’s Attorney.